This entry was posted in Uncategorized and tagged Lists, New Mexico, Week In Review, Weight Watchers. Bookmark the permalink. Yay for soaking black beans! I did that last night, too! Then I cook them in the Crock pot… The Best way! 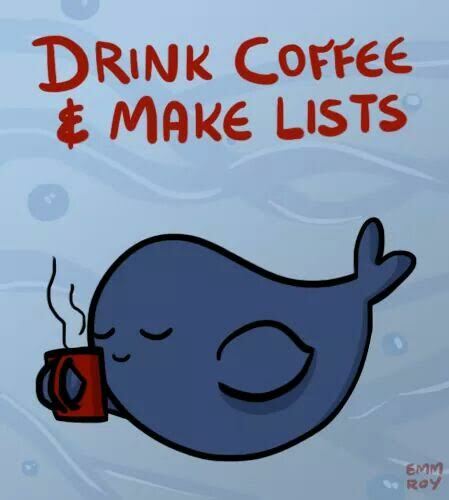 I love the little “drink coffee and make lists” picture. It’s perfect, and you had a bang up week, my friend. Congratulations on getting back on track with the food and fitness. It definitely paid off on the scale. I love the idea of listing out back up plans. That’s smart. Also break big list items into more detailed ones. That always helps me. For example, instead of saying “yard work,” I say “clean out front left flower bed,” “clean out front right flower bed,” “edge front lawn,” and “trim hedges.” It feels more obtainable that way and allows me to see just how hard I worked. Thanks for linking up and keep on listing!! Thanks so much for always being a support and always making me smile! I like your suggestions for breaking things down, too. Glad you like my little whale /dolphin… Not sure what he is! Someone posted him on Facebook and I snatched him up. Thought he was appropriate for WIR! Drink coffee and make lists… sounds perfect to me! Isnt it amazing how good it feels to just switch on and leave the slow cooker bubbling away doing its thing? One of my favourite ways to meal prep! Thanks for visiting! Yes, the crock pot gives me so much flexibility with what I cook. I have five of them so I guess I like them! Please stop by again!